pageA war veteran loses the drug battle. Click here for Part 1, Part 2. ‘During the war,’ says Farideh, ‘the days were dark and the nights were light in Abadan.’ Farideh now lives in Shiraz, one of the millions of refugees displaced by the war. I am in Shiraz — famous for its verdant gardens, springtime orange blossom and great poets — to talk to refugees like her and try to get a sense of what it was like for Ebby when they left a burning Abadan to escape the war. Shiraz is now a lively city of more than one million people, but back in 1980, ‘there was hardly anything here,’ says Farideh. ‘We came from Abadan, remember, which was built by the British. We had lovely lives, we were sophisticated. To us Shiraz seemed very provincial so it was very insulting to us to be treated this way by these people. On top of everything else.’ She shows me pictures of her wedding. The young couple captured in black and white are handsome and carefree. A slim Farideh pouts at the lens, her skirt several inches shy of the knee, her black beehive dropping teased curls on her brow while beside her my youthful uncle seems filled with confidence of the future. You can almost hear the money jingling in his pockets, an air of immense well-being pervading the scene. ‘Ah,’ Farideh sighs, ‘Those days in Abadan. Dances at the yacht club, parties at the Abadan Hotel…’ Farideh still possesses cheekbones to swing off, but her hair is hennaed to cover the grey and her figure long ago permanently shrouded in a shapeless dress. It may be 20 years later and she may still be living here, but Farideh has never forgiven the Shirazis. Although the eighth-century martyrdom of Imam Hossein drives Iran’s Shi’ism, with thousands collecting during the month of Moharram to commemorate Imam Hossein’s death, flagellating themselves, beating their chests and crying, in reality, most Iranians didn’t want to be martyrs, most mothers weren’t praying that their sons be killed for the glory of Allah. Iran liberated Khorramshahr in May 1982 and in June, Iraq called a ceasefire which was rejected by Iran. The Iranian Chief of Staff General Sayed Shirazi vowed to ‘continue the war until Saddam Hussein is overthrown so that we can pray at [the holy Shi’ite town of] Karbala and Jerusalem.’ This marked a turning point in the war, when Iran turned on the offensive, trying to push into Iraq. For Iran’s new Revolutionary government, the war may have served a useful purpose of allowing it to consolidate its power and see off opposition groups. 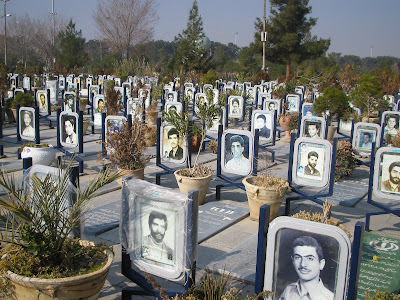 The Revolution had empowered many disenfranchised Iranians and the war held them together. For the world’s powers, the Iran-Iraq war ensured a weakened Iran, one unable to spread its fundamentalist fervour throughout the region. At different times through the eight years of the war, various western powers supplied arms to both sides though Iraq received the most conspicuous help, in both armaments and economic aid. By 1984 it was reported that some 300,000 Iranian soldiers and 250,000 Iraqi troops had been killed, or wounded. Saddam started using chemical weapons against the Iranians in 1982 with use of non-lethal tear gas but its success in disabling the Iranians led to many more chemical attacks where mustard gas and Sarin nerve gas were used. Iran charged Iraq with 40 uses of chemical weapons between May 1981 and March 1984 and in 1986 UN secretary general, Javier Perez de Cuellar, formally accused Iraq of using chemical weapons against Iran. Citing the report of four chemical warfare experts whom the UN had sent to Iran in February and March 1986, the secretary general called on Baghdad to end its violation of the 1925 Geneva Protocol on the use of chemical weapons. According to his wife, Ebby didn’t want to be a martyr. By the time he was called to the front, war weariness had set in among Iranians and the troops. With Iranian troops called to push into Iraqi territory, many of the soldiers had lost their zeal: they had wanted to defend their own land, not invade Iraq’s. The battles were horrific and losses heavy: mass graves harboured thousands of bodies and tales of drug addiction in the trenches was rife. Away from the front line, Iran’s economy was suffering — by 1987 nearly one in two Iranians was unemployed and shortages of basic commodities grew worse. The population had boomed, nearly tripling in the years since the Revolution to 60 million by the end of the war. The five ‘wars of the cities’ had spread the terror to all of Iran’s main cities and nowhere felt safe. I had certainly heard plenty of anecdotal evidence about drugs and even alcohol at the front. Maybe that is how Ebby became addicted to opium, but we will never know. All they knew for sure is that by the end of the war, when Ebby came home, he had a habit and his parents, worried and not knowing what to do, protected him. Iranian society is formal and much store is set by respectability. A drug-addicted child is a problem that affects every member of the family: Ebby had two marriageable sisters and so he was sheltered and supported by his parents who gave him money to feed his habit, having no idea what else to do — at that time there was no formal support for addicts or their families. Abadan is no longer the sophisticated city of pre-revolutionary days. The grand Abadan Hotel where my parents would dance the night away is now a broken down shell of a building. Braim, the residential area of the oil company still has clean streets and rows of bungalows but the entrances to its streets are now fenced off to prevent locals coming in. The refinery is still at work — in 1997 it reached the same rate of production as before the war — and the waters of the Shatt still flow gently between the town and Iraq’s fields of palms, but the main town is a dusty relic of its former self, the pavements half unpaved, and streets with their neon shop fronts a mixture of new buildings, shambolic old buildings, and gaping holes where bombed out ruins have not been rebuilt. My cousin Milad is taking me on a tour of Abadan. He is a young man in his early 20s, typically Abadani, with slicked back hair and a pair of Ray Bans permanently fixed on his face. He speaks with an Abadani accent, his Farsi peppered with English words (another legacy of Abadan’s cosmopolitan past) and he is wearing pointed shoes — the latest fashion — and he takes great care over his clothes. Khuzestanis have ever been thus: they have a reputation for being fond of looking good and having a good time, the fashion for slicked back hair and Ray Bans stretching back to the glory days of Abadan. (In our home in London there is a 1960’s picture of my youthful father after a decade of living in Abadan. His hair is slicked back and he is wearing Ray Bans. He is not from Khuzestan but it is infectious.) It was Milad who came across Ebby a year ago, begging on the streets, and it was Milad who identified Ebby’s body when he noticed him missing from his usual post. It is early evening and and as it is winter, the climate is at its best, balmy and breezy with no sign yet of the hellish humidity that besieges Khuzestan nine months of the year. He points out the various bazaars that bring in goods from Kuwait, brand goods that people clamour to buy, from shampoo to coffee whitener. He points out the area called the Kuwaiti bazaar, opposite the cordoned off site of the old infamous Cinema Rex, historically the starting point of the Revolution: on 20 August 1978, the Cinema Rex was locked from the inside and set on fire, resulting in 430 deaths. It was widely believed that the government of the Shah was responsible: there were several dissidents inside. This sparked mass demonstrations against the Shah, who was overthrown six months later. Recently there was another fire on the site and now it is being prepared to become a new shopping mall, selling shoes. Milad tells me that several sets of bones have been unearthed since the work started. Turning down a side street, Milad shows me where Ebby used to sit, outside a shop selling brightly patterned blankets. ‘He was cold at the beginning of the winter,’ he says, ‘so I bought him a blanket here.’ Across the street, on a corner outside the bank where Ebby would post himself through the mornings begging for money, stand his ‘friends’ — other addicts clustering around a blind cigarette seller with an Arab scarf around his neck. They are in various degrees of narcosis: one man is standing, leaning at a dangerous angle, another is crouching on the ground, head falling forward, shoulders hunched. Everyone knew Ebby, Milad says, and they let him do whatever he wanted. They knew he had AIDS, they didn’t want to go near him. There are an estimated 2 million drug addicts in Iran though some put the real figures as high as 6 million. 200,000 are injecting drug users. This is a high proportion of a population of 68 million — the United States, for instance, has one million opiate addicts in a population of around 270 million. Last October, Reza Sarami, who heads the anti-addiction programme of the national anti-narcotics trafficking body, reportedly said drug use was rising by eight percent annually, at this rate Iran could be counting nine million addicts — one seventh of the population — in 20 years. Iran borders Afghanistan, the world’s largest producer of opium and the drugs come through Iran on their way to lucrative western markets. Historically there has been a tradition of opium smoking in Iran in which older men would gather at home to talk and share an opium pipe. This was a social activity and the opium smoking wouldn’t interfere with their lives. The big change is the move to intravenous heroin use, a change that can be partly attributed to opium prices skyrocketing after the Taliban’s ban on growing the poppy and heroin became cheap and available instead — a hit of heroin costs less than a packet of cigarettes. Add to this the largely young population of Iran, living with high unemployment rates, scant opportunities for recreation, fiercely contested, limited university places and growing rates of depression and you can see why there is such cause for concern. With intravenous drug use comes HIV and Hepatitis, and sure enough, AIDS is now being seen as a real problem in Iran. The first reported AIDS case dates back to 1987, when a six-year-old haemophiliac child was diagnosed to have been infected, resulting in the establishment of a National Committee to fight AIDS. Since then, there have been 4,237 reported cases of HIV/AIDS. Of this number, 626 have developed full-blown AIDS and 585 have died. But these figures are nowhere near accurate and even the government acknowledges that a better estimate is around 20,000. The figures don’t include the likes of Ebby, who was never treated or registered as an AIDS patient. Last summer, my uncle, Milad’s father, came to Abadan and took him to a local drug clinic. They refused to take him in, he was too infectious. There was no hope for him, they said, better not to risk other lives for one that could not be saved. Ebby returned to the streets with his swollen legs and the weeping sores on his feet. Ebby had had full-blown AIDS for a few years. The majority of Iran’s AIDS sufferers — 65 percent — are men who have contracted the virus through contaminated needles. Prisons are the main source of HIV infection; addiction is a crime and addicts possessing 5gms of heroin or 30gms of opium are routinely jailed. Some 180,000 people are incarcerated in Iran’s prisons, more than half on drug charges. Up to 100 inmates reportedly share a single needle. Ebby had been regularly in and out of jail over the years. ‘After Mina left and he became homeless,’ Milad continues, ‘Ebby would sometimes try to get jailed so he would have somewhere warm and dry to sleep.’ After he was so obviously suffering from AIDS, he literally couldn’t get arrested and Shapur Park is where he would mostly spend the night, sleeping by a cedar tree. According to other addicts, getting heroin inside prison is easy. Experts have called for a more moderate approach in order to curb the spread of drug-related AIDS, most notably by way of the free distribution of syringes to avoid contamination. A recent law has made it possible for pharmacies to supply free syringes to registered drug addicts signifying a sea change in the Iranian governments’ policy. Until recently the emphasis was on reducing the supply of heroin — now it is shifting to reducing harm. In the deprived streets of southern Tehran, I turn into a dusty cul-de-sac to find a door that I have been told has no sign. There is a curtain hanging across the open doorway and lifting it, I look down into a small courtyard filled to bursting with men, queuing. On the other side of the courtyard, there are steps leading to a gallery and the queue snakes up here, filtering to the right where, from small window, someone hands out methadone. I squeeze up the steps, turn left at the top and am ushered into a small office, also bursting with people, three desks and stacks of boxes. Centres such as Persepolis or the 65 ‘triangle clinics’ located in hospitals and prisons concentrating on a three-pronged approach (treating AIDS, sexually transmitted diseases and drug addiction at once) are pinpricks of hope in a dark landscape. As is the government’s new approach, in which about half of the approximately US$80 million allotted annually to fighting drugs now goes for supply reduction and half towards decreasing demand. Still, the numbers they are fighting are massive and while the causes for addiction are not being addressed, then people like Mr Rouhy and Dr Nassirimanesh are just fire fighting. Twenty miles from Abadan, we alight in Khorramshahr, declared holy ground since the two-year Iraqi occupation. Many buildings are still mere shells, the reconstruction here is slow; the economy has never really recovered from the destruction and depopulation the city suffered during the war. The city centre has shifted since the war as the old city centre has not been reconstructed, meaning that the uncle who accompanies me, takes a little while to get his bearings, even though he knew this area ‘like the back of my hand before.’ We head to the city hall to get a pass for Shalamcheh, the no-man’s land between here and Iraq which saw so much blood shed. Since it has become a shrine to the war, a place of pilgrimage, visits have been formalised: only special taxis make the trip to Shalamcheh and usually the passes are only handed out at the weekends, not during the week, as we went. However we were lucky to find an amenable official who, without looking up, wrote the requisite letter for us in response to our entreaties. The taxi speeds the couple of miles along an empty two-lane highway, flanked by a flat wilderness, usually dusty and empty, but in the last two days turned to marshes of mud by heavy winter rainfall. As we near Shalamcheh, there are mounted signs extolling the virtues of martyrdom, and there is a burnt out Iraqi tank half buried in the ground. This land used to support many villages but now there are only the straggling remains of one or two. ‘There are still lots of mines here,’ explains our taxi driver, a Khuzestani Arab whose own village is not far. We come to a small outpost manned by a couple of young guards. The driver hands over our letter while chatting to the guards who he obviously knows well: he is licensed to come here certain days of the week. They usher us through and we turn right onto a long straight road, surrounded by this vast emptiness, the odd shelled-out tank the only punctuation. There are the odd remains of machine guns and the burnt-out shells of tanks abandoned at the side of the road. Occasionally there are large banners bearing the garishly painted images of martyrs who died in the war, of generals, of ordinary soldiers too. We draw into a muddy parking lot, all around us the dips and elevations of trenches and dug-outs still clear in the landscape. ‘Shalamcheh: welcome to Iran’s Kerbala’ announces a sign. Kerbala, in Iraq, is where, in the 8th century, Imam Hossein was martyred. Ahead of us lies a prayer area to the right, just an aluminum ceiling covering the devout from the sun and rows of billboards displaying pictures. The shrine itself lies to the left, a dome covering a cool hall supported by columns and culminating in a centrepiece of a glass case, set in a depression in the floor edged by sandbags and red paper flowers. 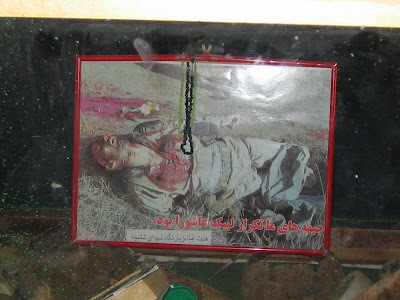 In the glass case there is the broken remains of guns, helmets, Korans and other relics of soldiers’ lives collected from these killing fields, all watched over by the picture of a dead, bloody soldier. Stories abound of shocking incidents the war made commonplace here: half a garrison lying down on an electric fence so that others may go through; a hundred boys throwing themselves in a river to act as a human bridge; the children that ran at Iraqi tanks with Molotov cocktails or hand grenades. You can see why the Iraqis were scared. There are burnt trunks of date palm trees spiking the flat wasteland, and looking over the scrub and mud, I think about Ebby living through the winter here, waiting in muddied trenches, scared. Rousing religious tunes would be played over Tannoys and mass prayers led before battles to whip the troops into religious frenzy, but by the time Ebby was here, war weariness had set in and volunteers were drying up. Many of the troops were conscripts like Ebby and they didn’t have the same zeal as those who had flocked to enlist in the first few years. The silence here is eerie and somehow full. Underneath my every step may be the bodies of men and boys: a troop of 400 that came from the holy town of Mashad in the northwest of the country, only to be buried alive by the Iraqis on arrival. Four major battles were fought from April to August 1988, in which the Iraqis massively and effectively used chemical weapons to defeat the Iranians, using nerve and blister agents against Iranian command and control facilities, artillery positions, and logistics points. In the last major battle of the war, played out here, 65,000 Iranians were killed, many with poison gas. The pictures lining the prayer area don’t shy away from any of this: there are bodies, dismembered, beheaded, bleeding, wounded. Men praying in the trenches, looking shell-shocked, men marching, laughing, fighting, bearing their arms and hugging their comrades. Pictures of the dead with their names underneath: some just young boys, some in the height of late 1970’s fashion, frozen forever in their youth. Just as shocking as all this blood and guts is a picture of a troop marching in the area at the start of hostilities: Shalamcheh was like an oasis, green and lush with date trees and all shades of bushes and plants. The men marching through this fecund land are laughing with confidence, convinced of their victory, passionate about their God and their land. 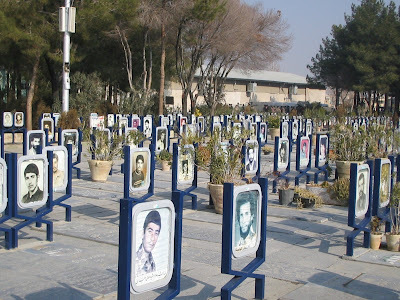 The pictures are here as a testament to the glorious values of martyrdom, of the bravery of Iran’s sons. To me they just speak of futility, a waste of young lives and of land as old as time. The war between Iran and Iraq was one of the great human tragedies of recent history. Perhaps as many as a million people died, many more were wounded, and millions were made refugees. The resources wasted on the war exceeded what the entire Third World spent on public health in a decade. And even now, as those who lived through the war struggle to come to terms with their memories, the war is still claiming its casualties. In death Ebby has found a status he never enjoyed in life. For many of the men who fought in this war, the only honourable outcome was death and the martyrdom that entailed. For those that survived, living proved too much to bear. For some, it meant reintegrating into a society that every year cared less for their war. For others locking away the war years and striding on with life as if those years never happened was the only way to go on. For the likes of Ebby, that was not an option. Despite support from family, a loving wife and children, Ebby’s love for the drug that helped him forget was stronger than anything and to it he sacrificed his family, his home and, in the end, his life. While still alive, reeling through the streets of Abadan, he was a disgrace to his family, an embarrassment to his country and a shameful testimony to the war that shaped him. In death, Ebby has finally become once again a beloved son, a much-missed brother and a loving father and husband. Another martyr to the war that continues to haunt its survivors. An abridged version of this article first appeared in the Financial Times magazine. Kamin Mohammadi’s first book, a family memoir and modern history of Iran, will be published by Bloomsbury later this year. You are currently browsing the archives for the Shalamcheh category.